Since I was playing with saws and nailers all weekend building mirror frames, I thought it was a good time to get a jump start on yet another project I’ve been thinking about for a while. 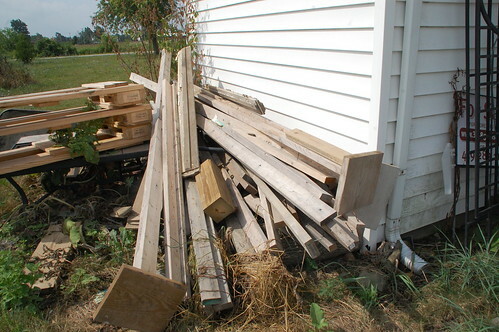 By “for a while” I mean “every time I walked past this wood pile for the last year”. So instead of rolling your eyes and thinking, “not another project” (not that I know anyone who would do that) you should probably congratulate me on my restraint in waiting this long to start it. 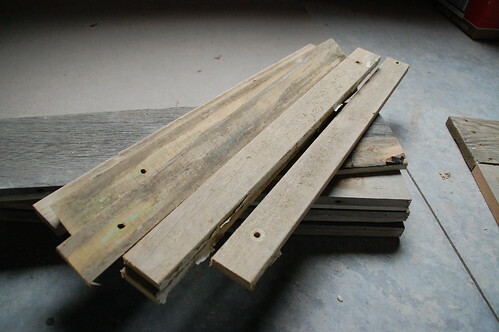 That wood pile is basically wood purgatory– the place old lumber goes to be weathered in the elements before making its way to the burn pile, or, if it’s lucky, to find new life as a fancy piece of wall art. There were three old sections of door frame from when the Memorial House was gutted that had been hiding out in the pile for a while, and I thought they would suit my purpose just fine. 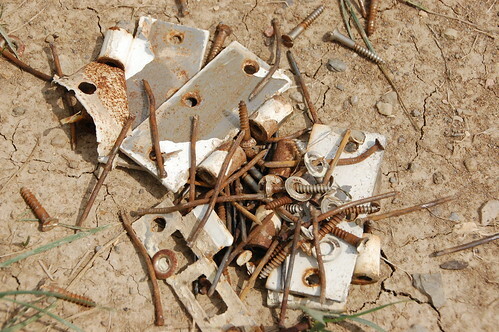 As long as my purpose was to get a sunburn while spending a few hours pulling the mother lode of rusted metal off of them. I’m not even sure how someone managed to remove those door frames from the house without taking all the walls down with them. There was a nail every two inches. 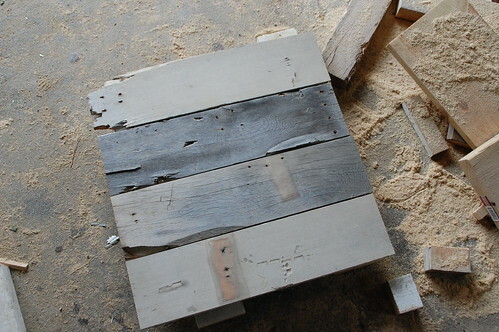 However, when the deed was finally done I cut the boards into 20″ pieces and then brushed all the loose dirt off of them. 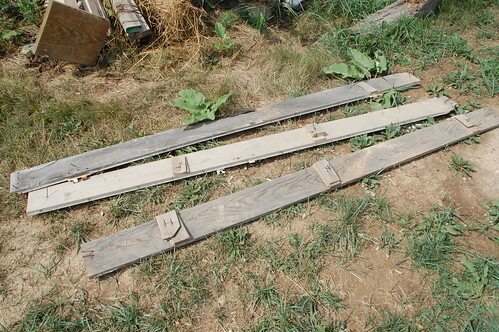 I also cut down some smaller scrap to use to attach my planks together. 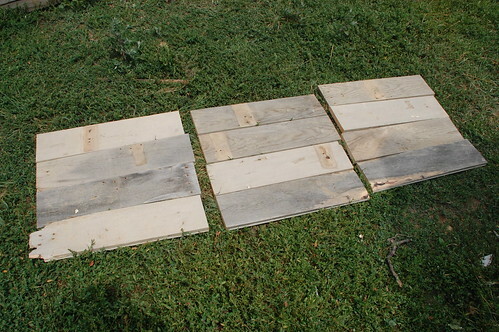 The planks were laid out four to a section to make three 20×20 panels. I used 1″ staples to hold everything together. And if you’re wondering what in the hell this is that I just built? Anyway, the big question now is, what do I do with my old gnarly beat-up wood canvas? I have some ideas, but we’ll have to see where I land with it, once I start painting/staining. I love the wood. 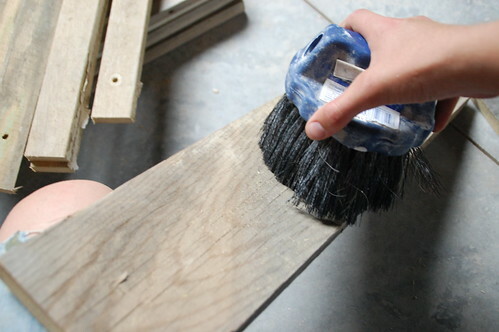 You’re lucky to have weathered wood like that on hand. The picture of the trees is great but I think I’d go more for the flower for a bigger statement. Oooh – this is such a neat idea. I love your misty picture – you could have it printed as a poster and glue it to your wood canvas then distress/age it, if you didn’t want to try to paint it outright. But by all means, use that art degree! I spent ten years paying my art degree loans off and have yet to actually work in the field – unless you count all the “side” projects I’ve done – which come to think of it, I do! I just didn’t know until after I got my degree that I didn’t want to be creative “on demand” for money. Live and learn! Printing the picture is also a good idea… I’ve seen that done. But I don’t want to lose all the character on the wood outright. However if the painting doesn’t go as planned, that’s my backup option! Could you apply the print in a manner that still shows some of the wood, like the Manhattan map does? Use the best of both worlds. Do you need a headboard? This one is a bit simplicistic, but I love the idea. LOVE this Kelly. 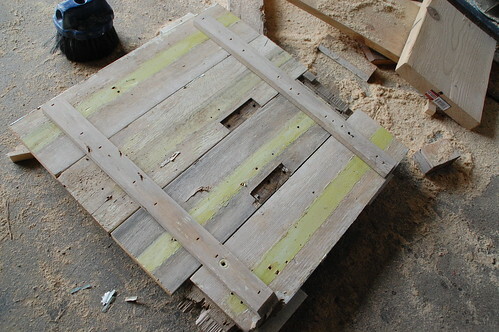 I do need a headboard, so I’m keeping this in mind for the next salvaged wood I find. Did you see her barn door? Pretty cool also. black and white screams zentangles. if you don’t know about them….google ‘zentangle’ and check out all the glorious ideas you can incorporate. i tangle gourds….it’s a great way to de-stress at the end of your day. i’m going to tangle a whole wall in my new house….maybe my studio wall….or the dining room wall. love tangling! I tend to vote for the idea of a painting of some sort. Speaking of old scrap, I have to say that you can do marvelous things with redwood. 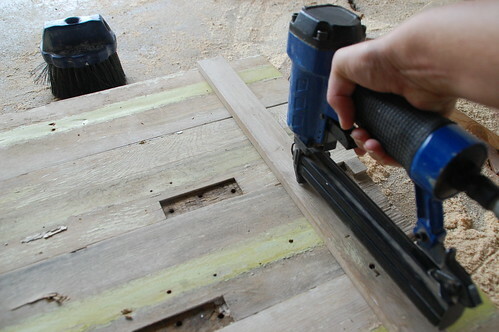 I used quite a bit for outdoor benches and ended up ruining a couple of long pieces (I was routing in a design). I kept them because all heart is not exactly cheap. Because it’s redwood, it held up to the weather quite nicely on the covered patio. A couple of years later, I surfaced those pieces of redwood and made some glorious picture frames with it! By then the wood had aged to perfection. I love the idea of a picture and if your tree shot won’t work as is get it cropped & blown up! Then again, you can always take pics and when “the one” shows up use it! I love your tree shot, but there’s always nuts, bolts, screws and a favorite drill if ya’ want a bit industrial! You could print on thin paper like onionskin or something and then decoupage, or do something like this http://www.rexart.com/appdecoupage.html. I saw someone do similar to what they describe on a TV show and it turned out pretty sweet. Those are great instructions Jessie, thanks! Can you believe I’ve never decoupaged anything before? I’m definitely going to keep this as an option. 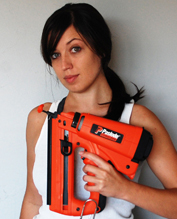 BTW–thanks for the shout out in your Project ADD post! Does anyone know how they got the image from pottery barn onto the wood? The map looks like decoupage but the aviator print says it it printed on. 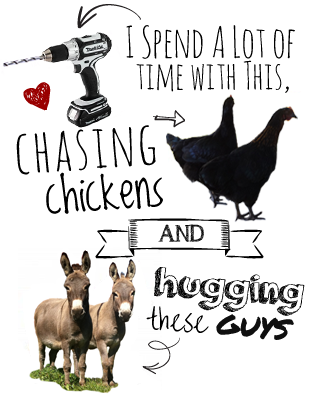 What project did you end up doing on your wood? Thanks for the useful information on credit repair on all of this web-site. A few things i would advice people would be to give up this mentality they can buy currently and pay later. Like a society all of us tend to do this for many things. This includes getaways, furniture, in addition to items we wish. However, you should separate a person’s wants from the needs. If you are working to raise your credit ranking score you have to make some sacrifices. For example you’ll be able to shop online to save cash or you can turn to second hand shops instead of costly department stores for clothing.